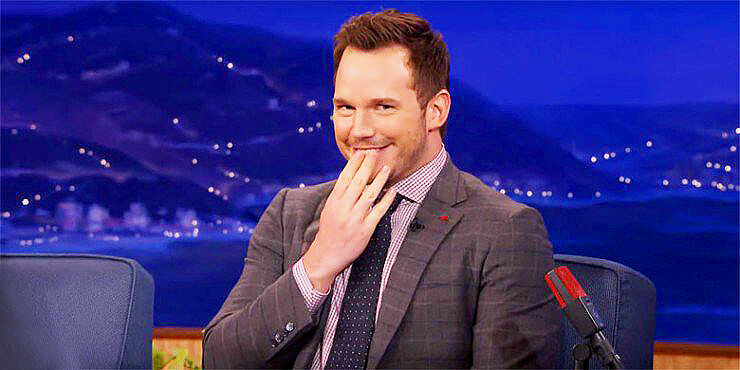 It seems strange to see Chris Pratt on a talk show without Jennifer Lawrence sat beside him. The pair are surely in the running for "best press tour ever" in promoting their new movie Passengers. Which has seen them hilariously hurl insults at one another like playground kids, perform magic tricks, and much more. In fact, if the reviews are to be believed, their press appearances have been more entertaining than the actual film, which critics have been a little damning of. But what do those stuffy film critics know, eh? Anyway, Chris Pratt can exist without Lawrence and here he is on his own on Conan chatting with host Conan O'Brien. Conan mentions that Pratt has been touring in Europe promoting the movie and then Pratt says he speaks a little German. In fact, he notes, would Conan like to hear a dirty joke in German? Of course the answer to that is always going to be "yes!" so Pratt then begins to tell it, in what appears to be fluent German. It's impressive and as a testament to Pratt's delivery people are laughing at the joke even though, at this point, they have no idea what it means. After telling it in German though Pratt does the decent thing and tells it in English so we can all hear it. It involves a little boy talking to his grandfather about where his grandpa got his nickname from. And it's definitely NSFW. Unless it's the office party, then it's totally fine. All of this does leave you with the annoying question in your mind, is there anything this guy can't do?